Displays an outline of a place's location. The template is intended to create a consistent style for the Lore namespace, as well as setting up a set of categories. See Category:Lore-Places for more information on the category structure. continent required Continent on which the place is located, or the name if the place is a continent. If the place has no continent, enter "None". If the place is outside of Nirn, enter "Mundus", "Oblivion" or "Aetherius", respectively. continentLink optional Link to use if the continent parameter isn't the full name of the continent's page. province optional Province in which the location is located, or the name if the place is a province. provinceLink optional Link to use if the province parameter isn't the full name of the province's page. province3 optional Additional provinces for locations which cross the border. province3Link optional Links for additional provinces if they are not the full names of the provinces' pages. region optional Region in which the location is located, or the name if the place is a region. regionLink optional Link to use if the region parameter isn't the full name of the region's page. settlement optional Settlement in which the location is located, or the name if the place is a settlement. settlementLink optional Link to use if the settlement parameter isn't the full name of the settlement's page. district optional The name if the place is a district. subregions optional A list of subregions of the current region. type optional Type of place, overrides the default entry determined by the above parameters if used. image optional Image to appear on left. appears optional Game in which the location appears. nocat optional If specified, prevents the page being added to any category. nothold optional If specified, overrides the Skyrim default of replacing Region with Hold. align optional By default, the table floats against the right margin; specify "left" in this parameter to switch it to the left. 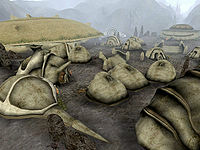 Ald'ruhn's Under-Skar is the main focal point for the city and is the area where many important Redoran councillors reside. This page was last modified on 1 February 2019, at 23:23.